Street Level provides inspiring encounters in photography for all; a place that is embedded locally and connected internationally; a creative setting to make, engage with, and buy photography. 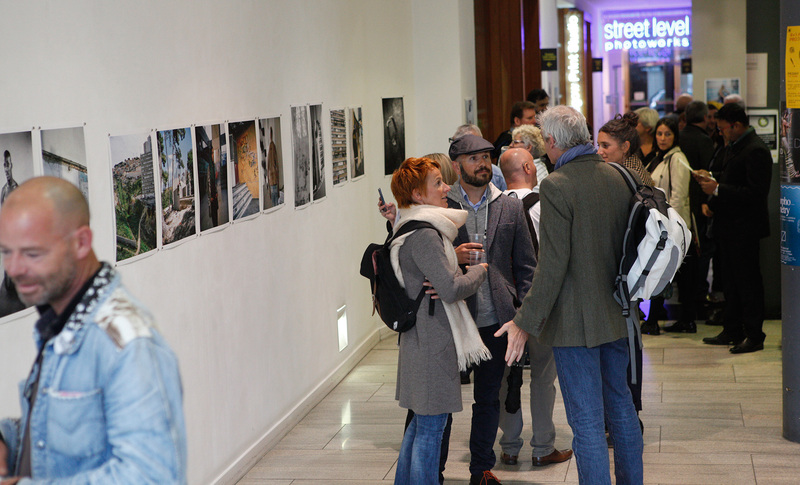 Street Level is a leading photography arts organisation that provides artists and the public with a range of opportunities to make and engage with photography. It is a gallery and an open access photographic production facility. We are committed to quality and equality across activity. We provide a high quality artistic programme in the city of Glasgow that is challenging and accessible, local and international, diverse and highly individual. Our programme’s reach is also extended through a growing partnership network of local, regional and national venues that we provide exhibitions for. We also devise and deliver education and outreach projects, which forge paths for lifelong learning and increase access to the arts for all who want to participate. We have a retail area selling photographic magazines, self-published zines and books, alongside editioned quality prints by artists both local and international. Visit our online shop for a selection of the work; a larger selection is available in-house. For full details on our exhibition policy including submissions of exhibition proposals see: Exhibition Policy. Festive Closure Times: the gallery reopens on Saturday 5th January at 10am. The facilities reopen on Tuesday 8th January at 10.30am. Late night Opening Hours. Occasional First Thursday of each month also open from 6 - 8pm. Please check before visiting. When visiting please plan your visit and check our website for dates to ensure we are not in between exhibitions (this happens for a few days every couple of months.) Opening times in offsite venues vary, please check relevant details. Street Level is based in Trongate 103 which is situated on Trongate in Glasgow's Merchant City area. If you are travelling to Glasgow, you can easily access Trongate 103 by public transport. By Train: The nearest mainline stations are Queen Street and Central Station. please call 08457 48 49 50 for timetable details. The nearest local train stations are Argyle Street and High Street. By Subway: St. Enoch is the closest subway station to Trongate 103. By Bus: Trongate 103 is easily accessible by bus. For full bus, train and subway information, please call Traveline Scotland on 0871 200 22 23 or visit www.travelinescotland.com. Parking: There are car parks situated on Albion St, King St and Glassford St which are all just a few minutes walk from Trongate 103. Graeme is Assistant Director of Investment Management with Brewin Dolphin in Glasgow, one of the UK’s leading wealth managers where his duties include managing the investment of approximately £100 million of client funds (individuals, charities, trusts and pension funds). He is a graduate of Strathclyde University Business School 1992 where he gained a BA in Finance and Marketing. Anna has worked in a variety of industries in both business transformation and technology programmes, combining knowledge of Business and IT Strategy, Programme/Project management, Business Analysis, Process Design, Architecture and development/SDLC to add value to any scenario. Anna is Programme Manager/Senior Project Manager with Clydesdale and Yorkshire Bank and is responsible for the delivery of system and capacity changes within the PPI Business unit. ‘The opportunity to be involved in the arts as a Non Executive Board member is a way for me to become more involved in the Arts Community as well as using my skills for something I feel passionately about. I believe in supporting the local community and being involved in Street Level is an opportunity to blend my knowledge of business and management with my interest in art and photography’. Keith is a Marketing & Communications Manager for a large housing association and has 25 years’ experience of working in the public sector in the ever changing world of public relations. Previously he worked as a press officer for various organisations in Glasgow including The Jazz Festival and The Arches. A keen writer, he has been a regular contributor to the Herald Arts Desk since 1994. In recent years he has curated and hosted exhibitions in off-beat locations in Glasgow and Greenock. He has a lifelong interest in photography but fell down on remembering the f-stop ratios. Instead he went on to become a prize-winning maker of preserves. Arts Consultant / Curator based in the south east of Scotland. With an academic background in painting, art history and art theory, and Arabella has a particular focus on cultural management and arts engagement in rural areas. She was recently a Curator for Timespan’s Museum of the North redevelopment initiative, and Curator/Developer at NHS Lothian where she is writing an holistic Arts Strategy for a new Community Hospital servicing East Lothian. She was previously Director of the Peter Potter Gallery in Haddington where she developed and delivered exhibition and engagement programmes that interrogated the interplay between contemporary art and cultural heritage. Prior to this she was Development Of cer for Crossing Borders and Visual Arts & Media Development Of cer for the region of East Ayrshire. Arabella also sits on the Board of the Scottish Contemporary Art Network. She recently sat on the Visual Arts Review Panel at Creative Scotland and previously worked as a Specialist Advisor to the Scottish Arts Council. I am a French, Spanish and TEFL teacher with 20 years experience teaching in Universities, FE colleges and secondary schools in Scotland, France and Spain. I am currently responsible for International Education at St Aloysius College, Glasgow. I am also a keen photographer and follower of contemporary art. In 2014, the facilities, retail and web developments were supported with investment from The Enterprise Ready Fund, Creative Scotland and The Foyle Foundation. (Glasgow Photography Group Ltd with charitable status (SCO 16470) trading as Street Level Photoworks. Registered in Scotland No 113667).